Last year we reported on volunteer Kylie Ireland for International Volunteers Day. 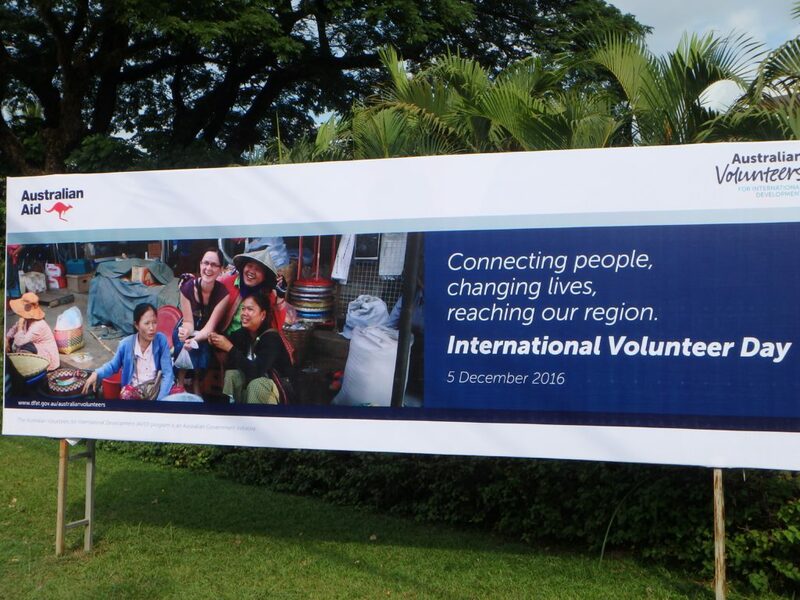 Kylie was the face of Volunteers’ Day at the Lao Embassy, with a pictured banner on the main road. This year, Kylie speaks to ScopeGlobal about gender diversity in science, technology and innovation in developing countries—sentiments that coincide with the International Day of Women and Girls in Science. You can also read about her volunteer work in an article recently published in the City News. “There are some really strong female scientists in Laos, but there are very few plant pathologists,” says Kylie. Kylie volunteered in our Laos program, assisting plant pathologists from the Ministry of Agriculture and Forestry for 18 months. It was during this time that she worked to address threats of pests and diseases in food crops, and mentored three young female trainees. “I think that my biggest contribution was simply in acting as a role model, as a young female scientist working with valid skills and knowledge to share, and in breaking down hierarchical barriers with the staff I worked with,” she says. Kylie’s volunteer role was part of a sustained effort we’ve been making with training around plant protection, biosecurity and food safety. These volunteer placements are being managed and mentored by eminent plant pathologist Lester Burgess, who is a member of our NSW Committee and an Honorary Professor at the University of Sydney, where he was formerly Dean of Agriculture. Kylie was one of three volunteers featured in the “Have a Go” videos, in which she describes her AVID volunteer work in Laos. Having completed her volunteer placement in 2015, she is now in a post-doctoral position at the Australian National University with the Plant Biosecurity CRC. The Crawford Fund is proud to play a role in the Australian Government’s Australian Volunteers for International Development (AVID) program to place young Australians in developing countries in both scientific and communications positions. These placements have been facilitated in countries including Indonesia, Philippines, Sri Lanka, China, Bangladesh, Fiji, Laos, Ghana, Kenya, Ethiopia and Vietnam.